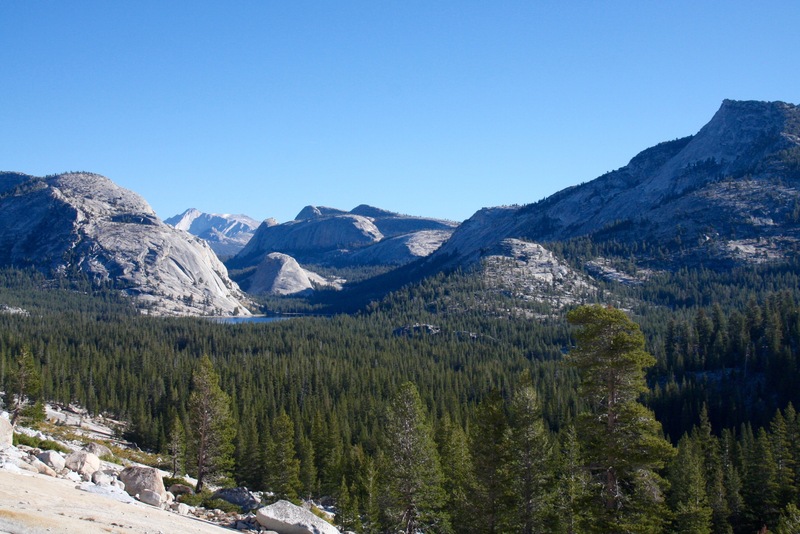 Every moment we spent in Yosemite made me wish we had more time to explore this magnificent wilderness country. As we drove out of Yosemite Valley towards the Tioga Road, mist formed in the valley floor adding an air of mystery to an already glorious setting. I half expected a bear to emerge from the mist, but alas no such luck. Although that just provides a handy excuse to return one day. 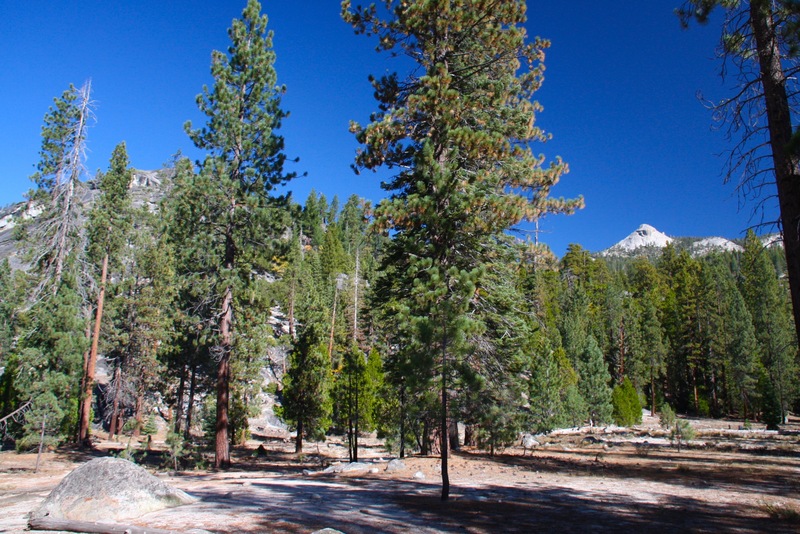 The Tioga Road is notorious for only being open for 6 months of the year at best, heavy snows keep it blocked from October/November to April/May. 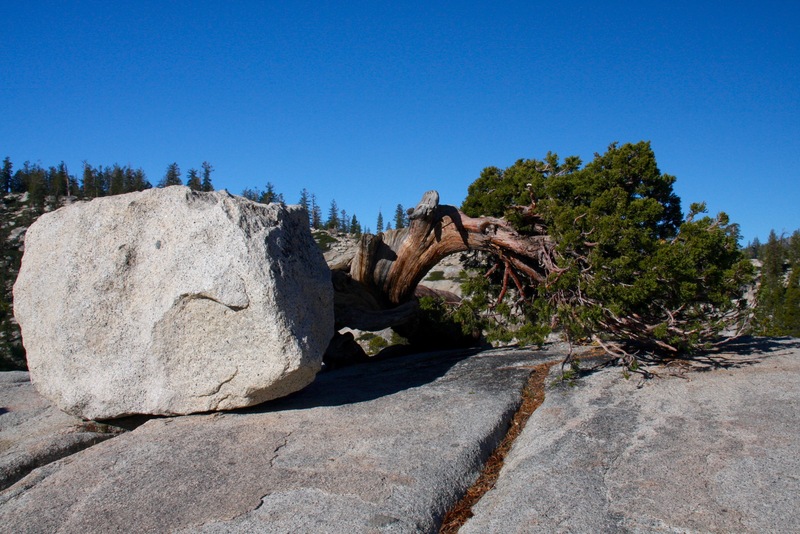 During which time the road, and the 9945ft Tioga Pass, are impassable. 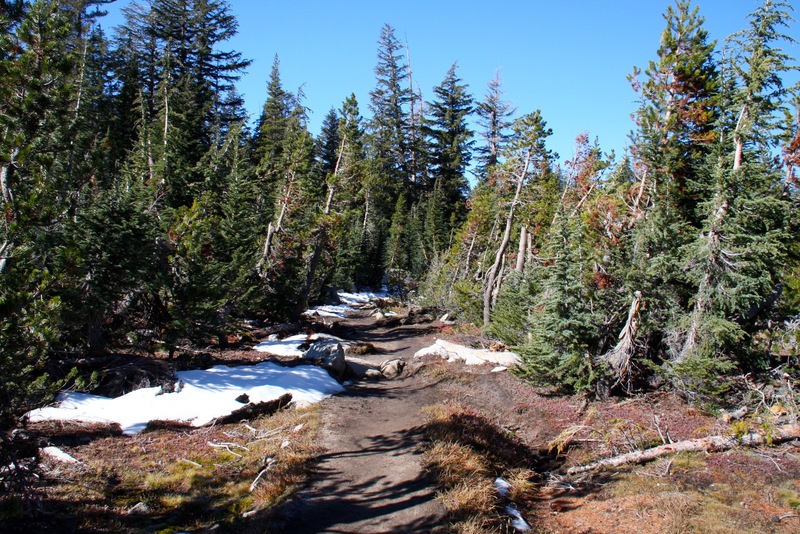 Snow stays on the ground up here pretty much all year round. 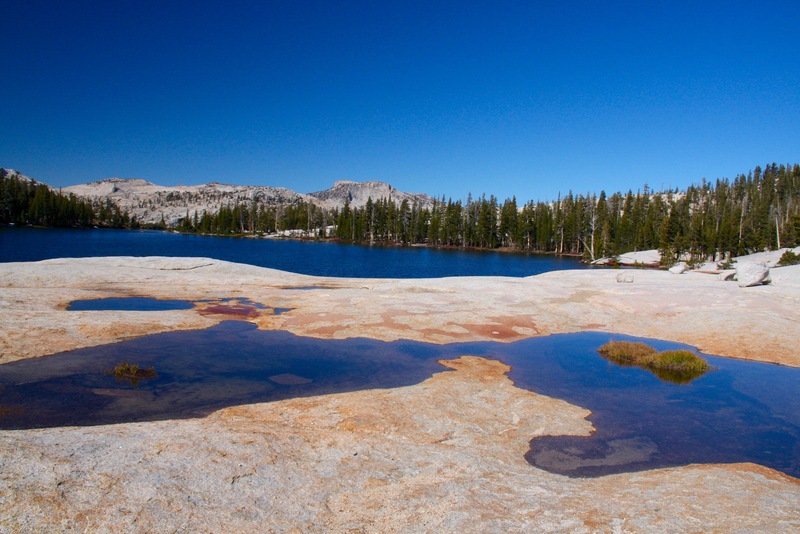 It’s also renowned for offering some spectacular views and excellent day hikes from the roadside. 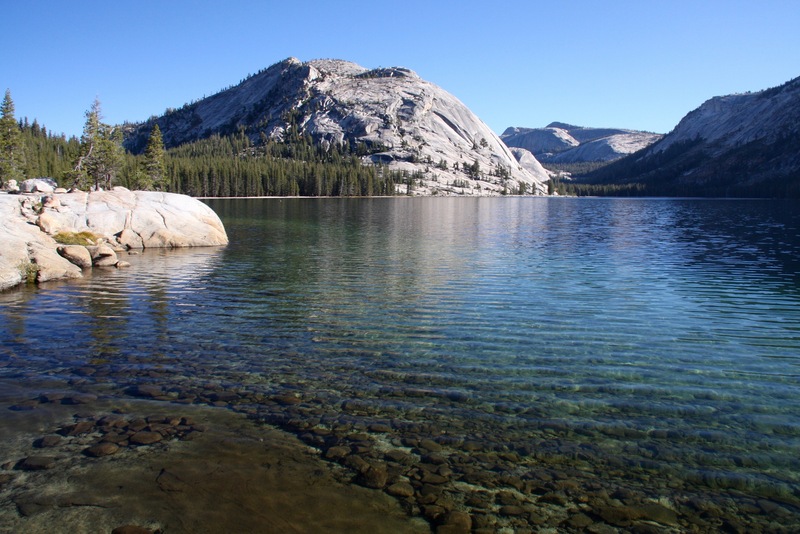 The Tioga Road rises up and over the Sierra Nevada, winding its way past bright green forests, granite mountains, lush high altitude meadows and crystal clear lakes. It’s probably one of the most beautiful stretches of road anywhere on the planet. 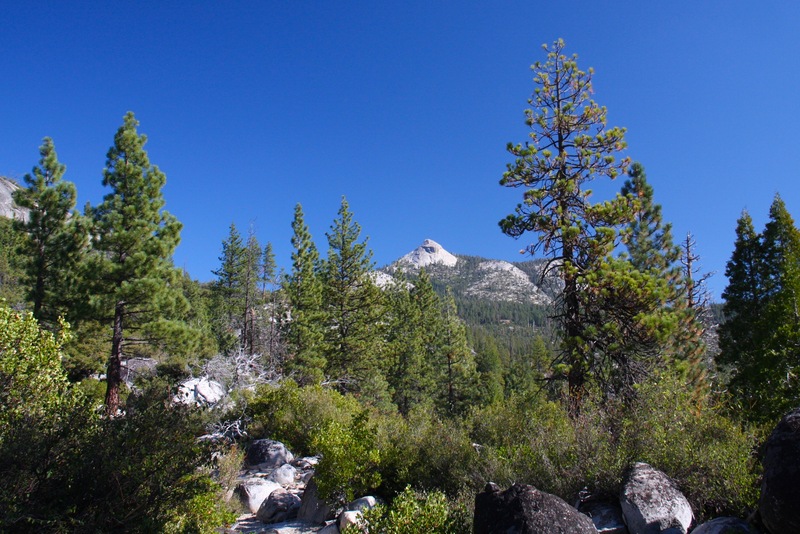 Even if you don’t stop to hike one of the many trails, be prepared to be made breathless by the views. 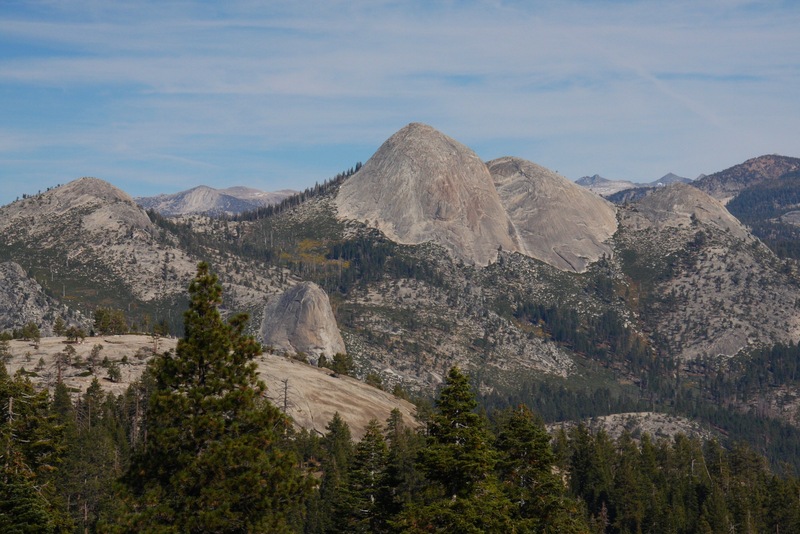 We reached the beautifully located Olmstead Point which offers spectacular views towards Half Dome and over Tenaya Lake and Tenaya Peak. 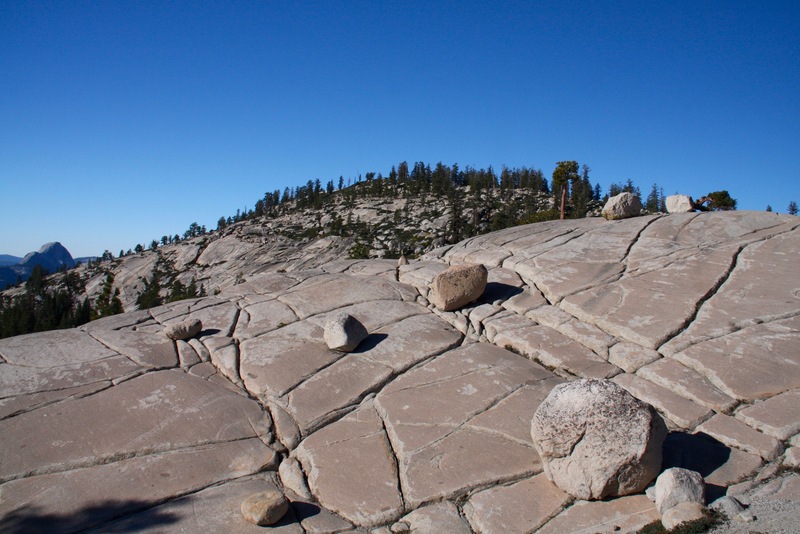 The area around here is strewn with boulders, large and small, almost like some giants had abandoned a game of marbles mid-match. Dropping further down we reached Tenaya Lake and went for a stroll around the shore. The water was crystal clear and icy cold. 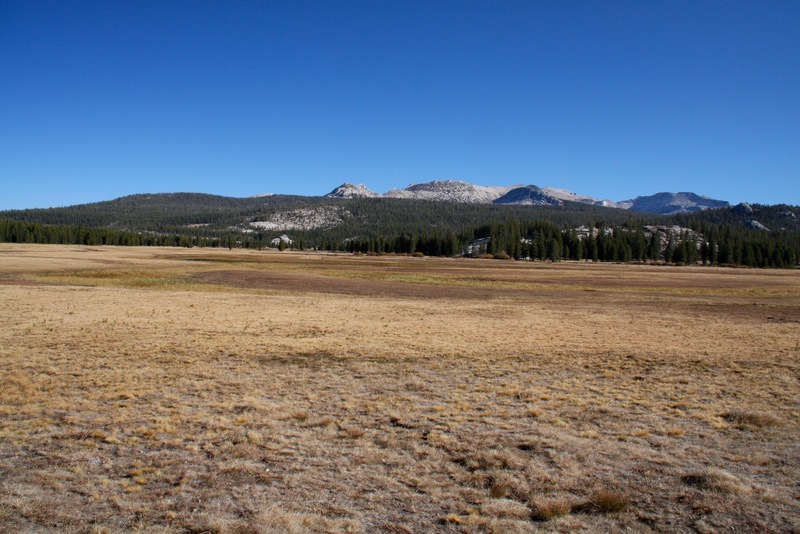 Further along the road are the Tuolumne Meadows, a vast open space in the middle of the mountains. 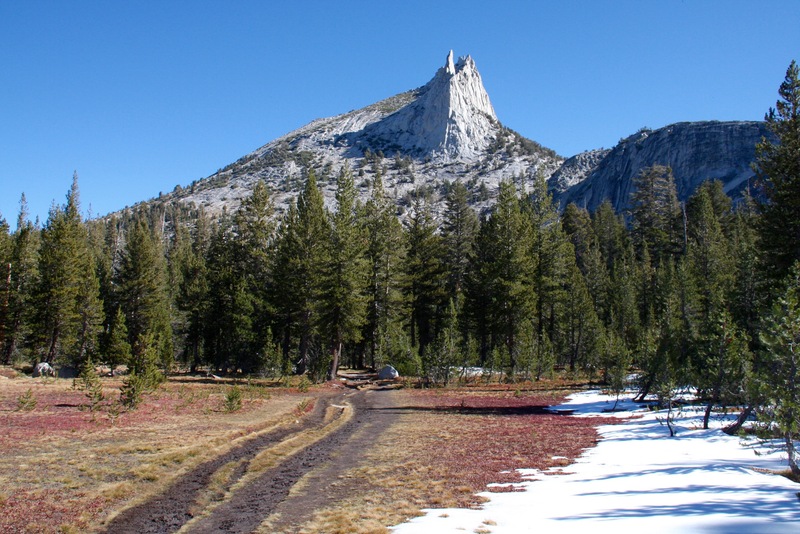 It’s from here that the trail to the Cathedral Lakes begins. 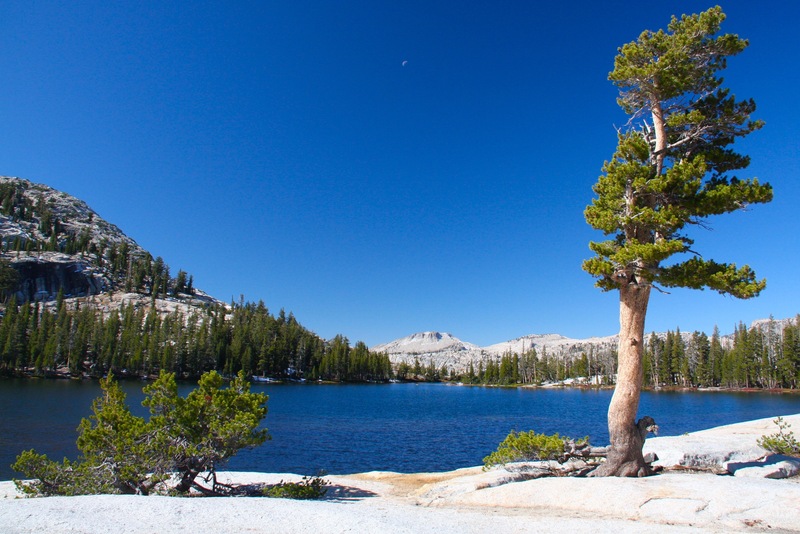 The Cathedral Lakes are incredibly beautiful, and the 7 mile round-trip is supposed to be one of the most popular in this part of Yosemite National Park. 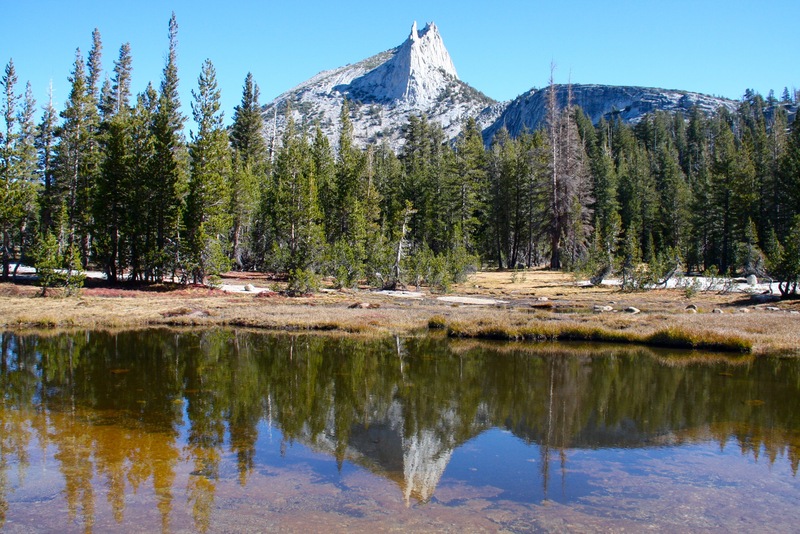 Not for the first time on our trip, I walked the trail alone and didn’t see another human being until I reached Lower Cathedral Lake. Even then it was only one person and we were headed in opposite directions. We had a quick chat and then went our separate ways, both of us returning to the solitude if our own thoughts amidst the extraordinary beauty. As I stood drinking in the views over the lake I couldn’t believe my luck. 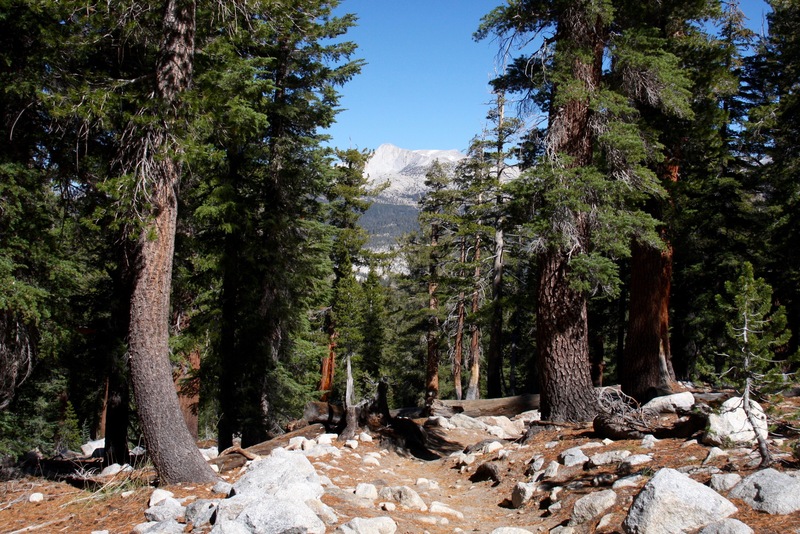 The trail takes you upwards on wooded paths for 3 or four miles, occasionally glimpsing mountains between the trees. 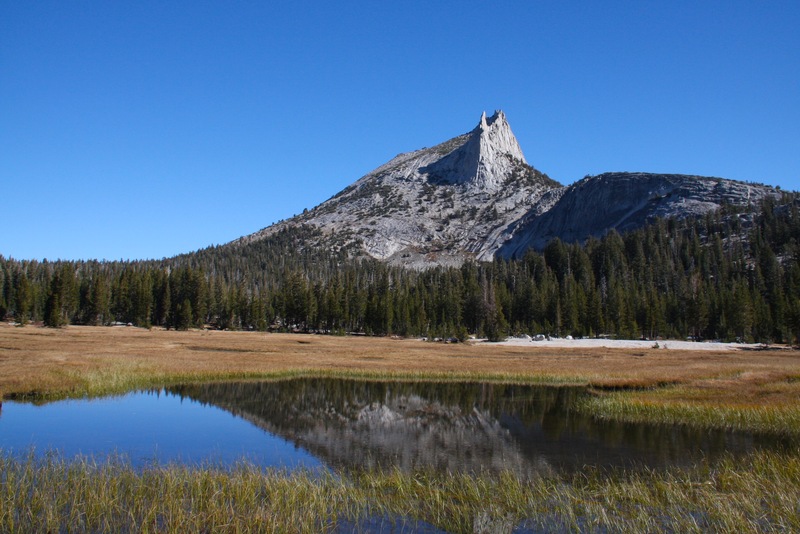 Eventually you pass under the shadow of Cathedral Peak, a dramatic craggy mountain that deserves its name, before walking out into another meadow. 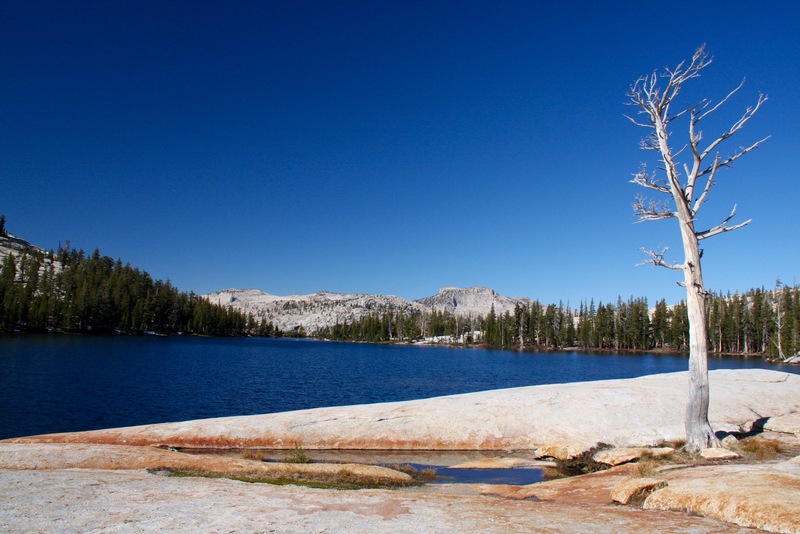 A couple of miles of walking through boggy terrain and you arrive at the shores of the lake. I can honestly say words can’t really do it justice. You really have to be there, but that first view over the lake will stay with me for a long time. I wanted to explore further to the upper lake and beyond, but the day was getting on and we still had a drive ahead of us. 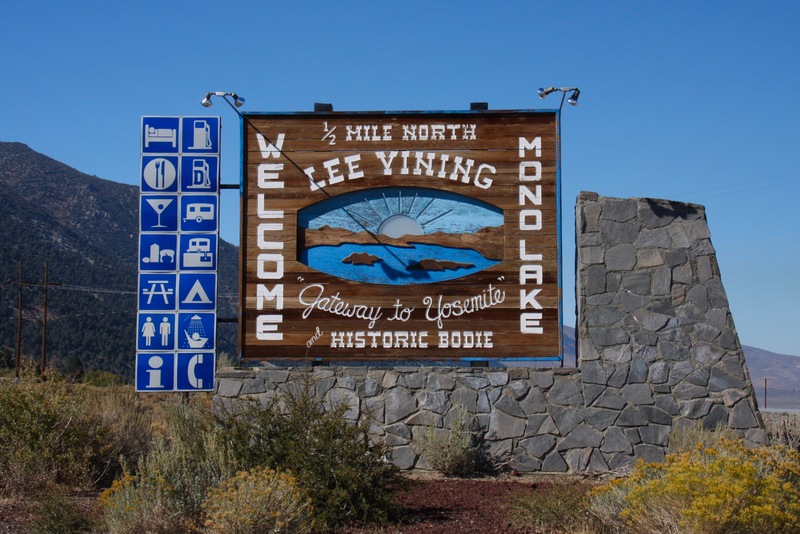 Our goal was Bodie, a former Gold Rush town abandoned eerily intact when the gold ran out. So it was back on the trail and back to the car. 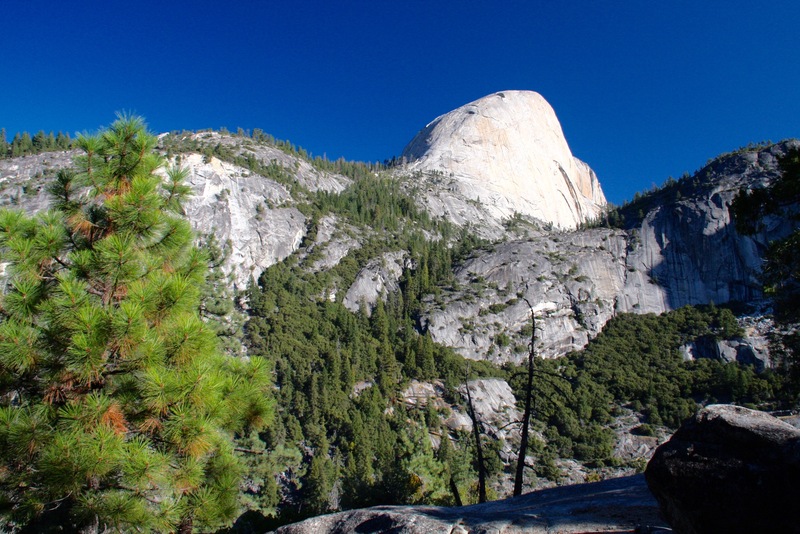 One of the classic Yosemite hikes is to Half Dome passing through Little Yosemite Valley. 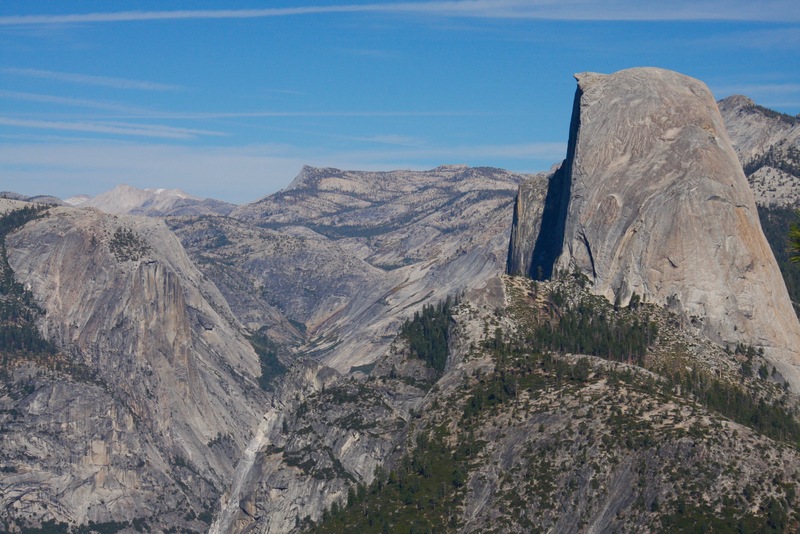 I’d have dearly liked to have done the hike, but a return day trip to the top of Half Dome from the Yosemite Valley floor seemed a little out of reach. 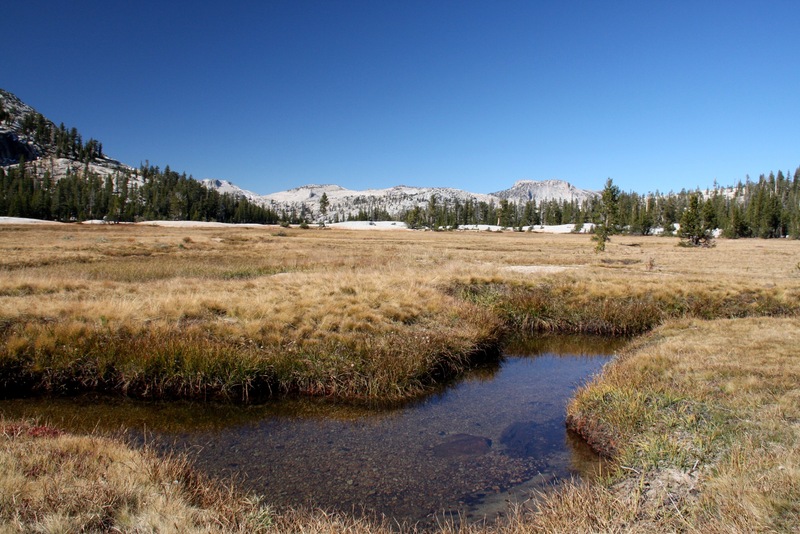 Following the same route takes you to Little Yosemite Valley – which is definitely manageable in a day – and must count as one of the most beautiful walks I’ve done. 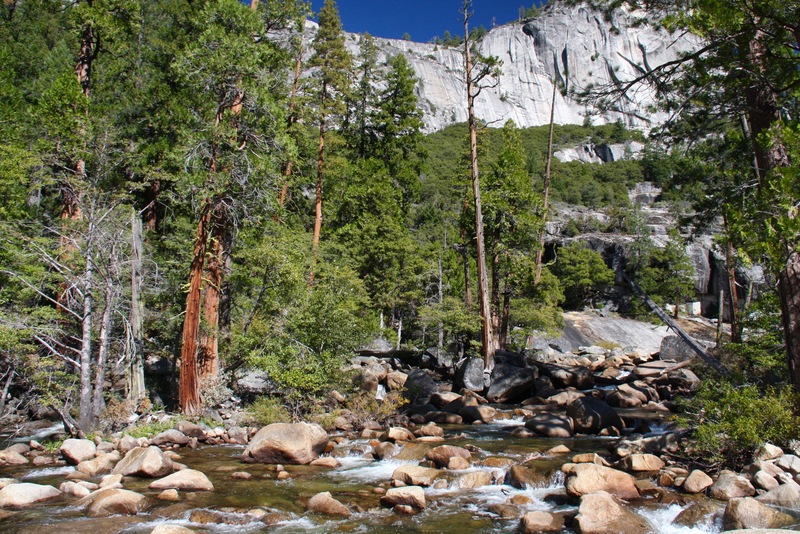 Jumping off the national park bus at the Happy Isles Bridge, the well-marked John Muir Trail led off between the trees and alongside the Merced River. 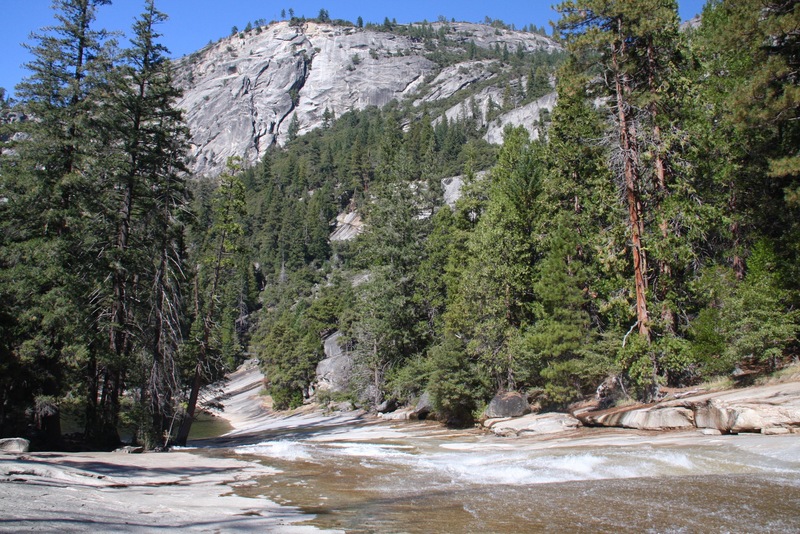 Not too far along, the trail crosses the river and gives you beautiful views up towards Vernal Falls. 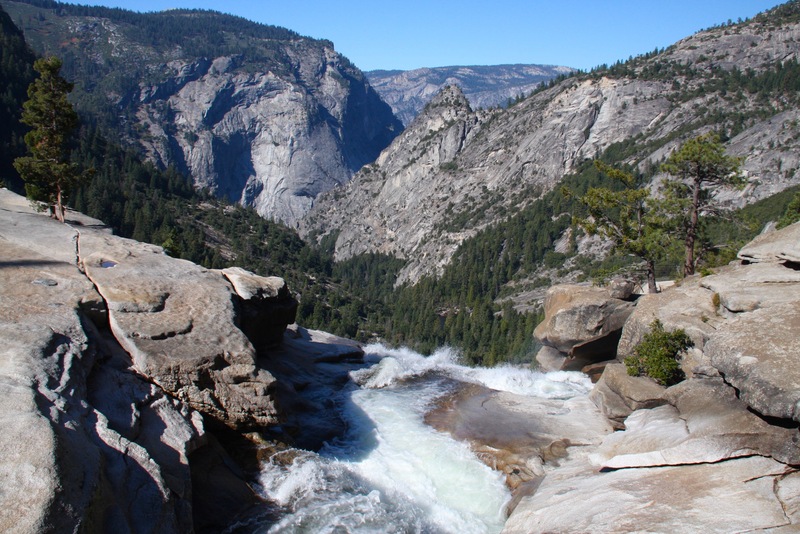 There’s probably not a bad time to view the falls, but they are at their best in late spring when swelled by snow melt. So far, so good, but shortly after crossing the river the trail cuts steeply up the cliff to reach a spectacular view point at the top of Nevada Falls. 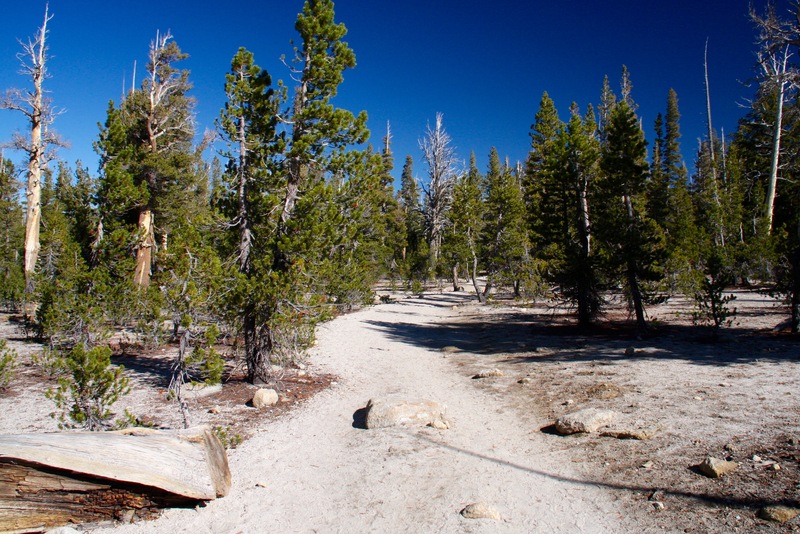 It’s a challenging but steady climb, and I was surprised to find myself alone on the trail. 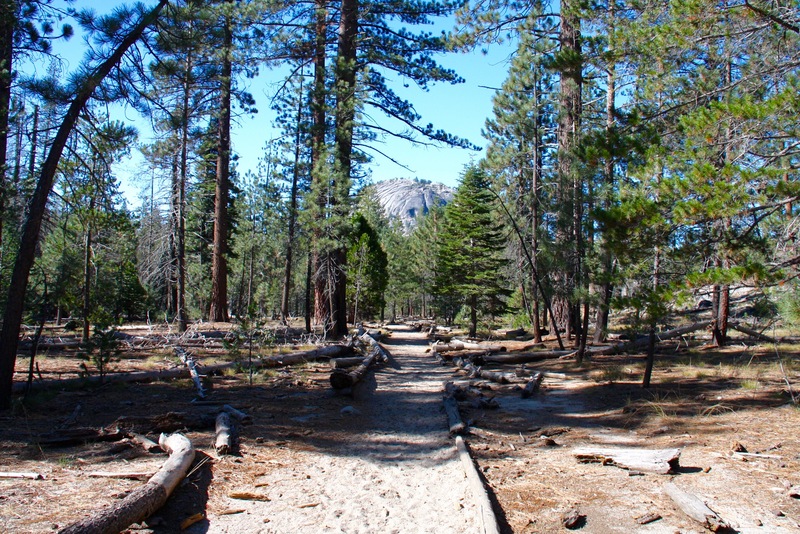 This is one of the most popular routes in the park, to be enjoying it in splendid isolation was very fortunate. Strangely, I only saw a handful of people all day, perhaps the bears had got them all? Every turn of the climb seems to offer better views than the last, and I found myself stopping to appreciate the landscapes. 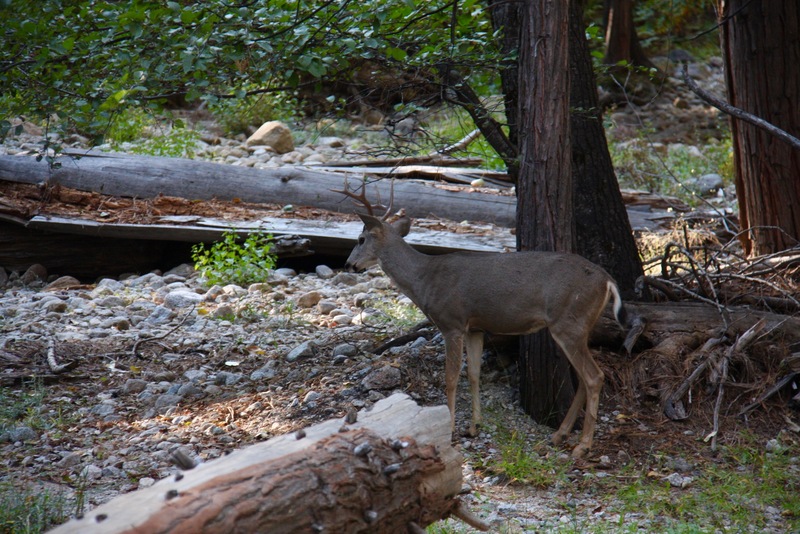 About half way up the climb, I heard something approaching behind me on the trail. 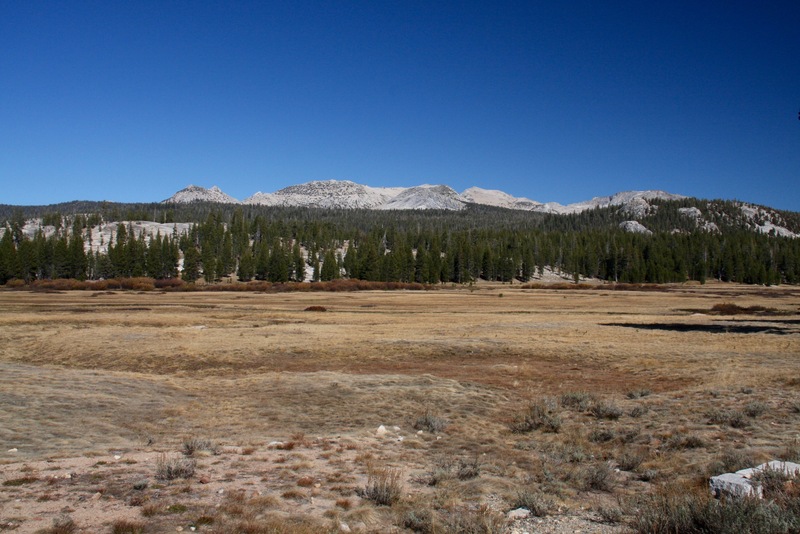 My mind turned to bears, but it was a line of pack horses led by a park ranger. 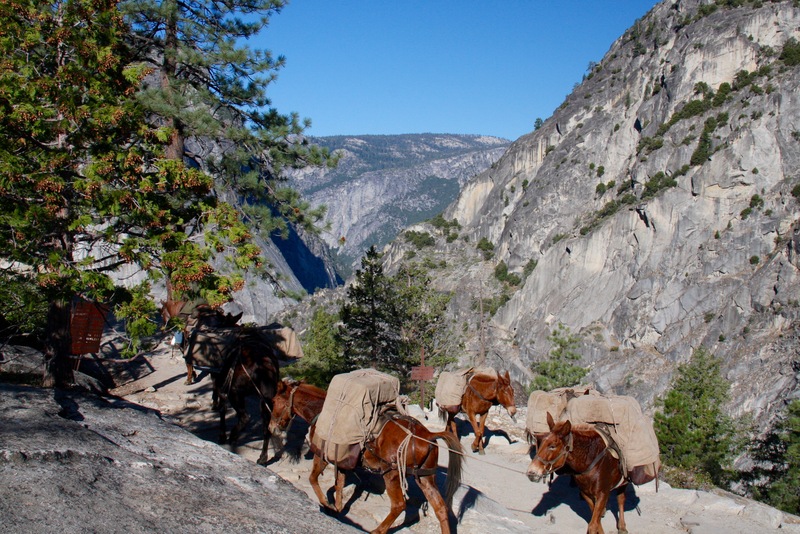 It was a scene straight out of the Gold Rush era, but this is how they transport materials for repairs in the park. 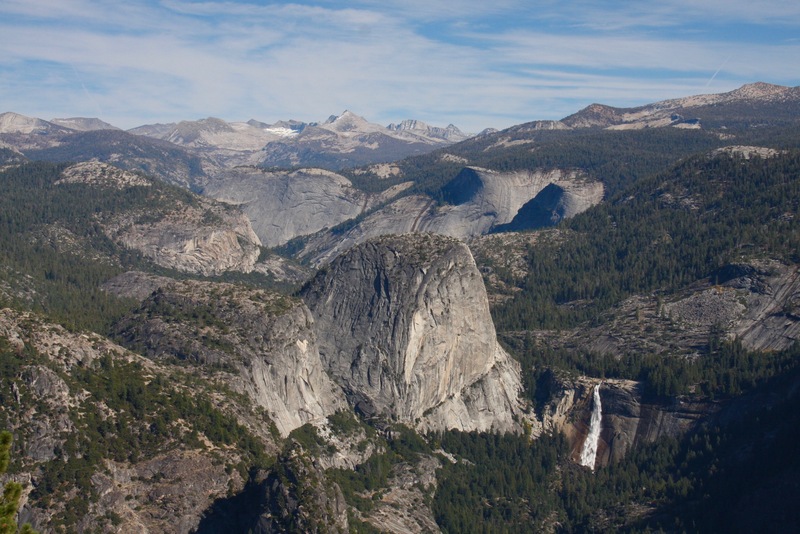 Nevada Falls is worth the trek. The views back down towards the valley are incredible. I stood at the top of the falls, water rushing over the edge, and had the entire landscape to myself. 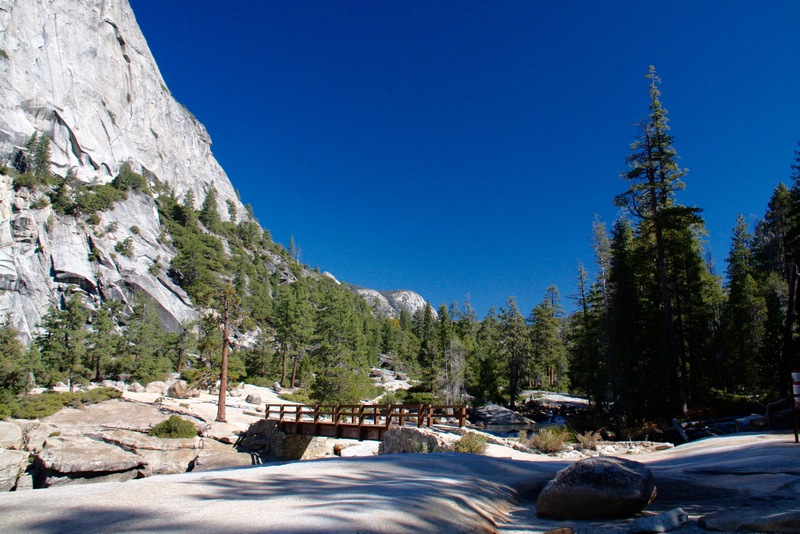 Nearby there’s a small bridge and the John Muir Trail heads into Little Yosemite Valley. 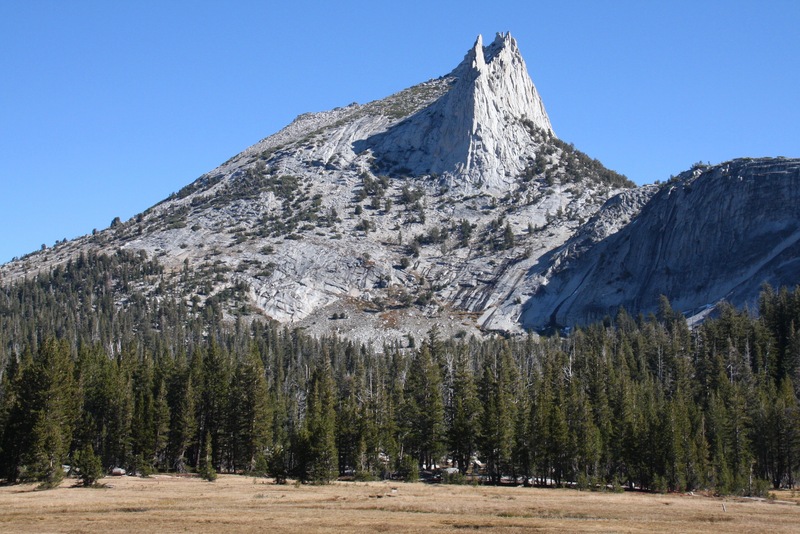 The whole scene is overshadowed by a massive granite monolith called Liberty Cap. Away from the waterfall the landscape suddenly becomes eerily quiet and calm, or at least as calm as it’s possible to be if you are walking along imagining that every shadow in the trees is a hungry black bear. 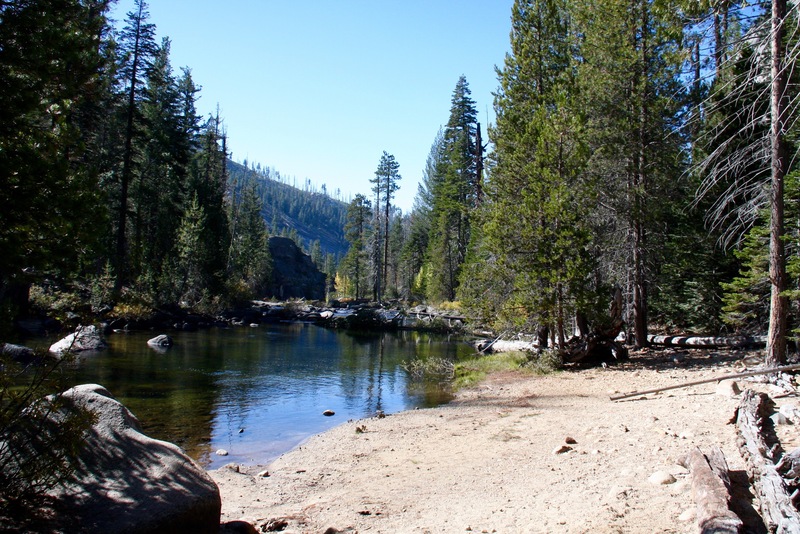 The route follows the Merced River through to a camp ground in Little Yosemite Valley. I’d clearly arrived after most people had set off for the morning as there were only a couple of tents there. 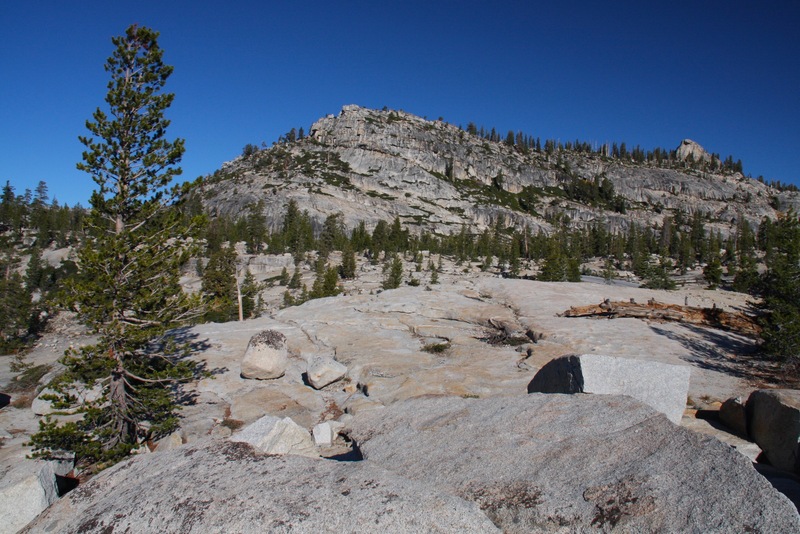 I carried on the trail for a little while further before deciding to return to the valley floor. 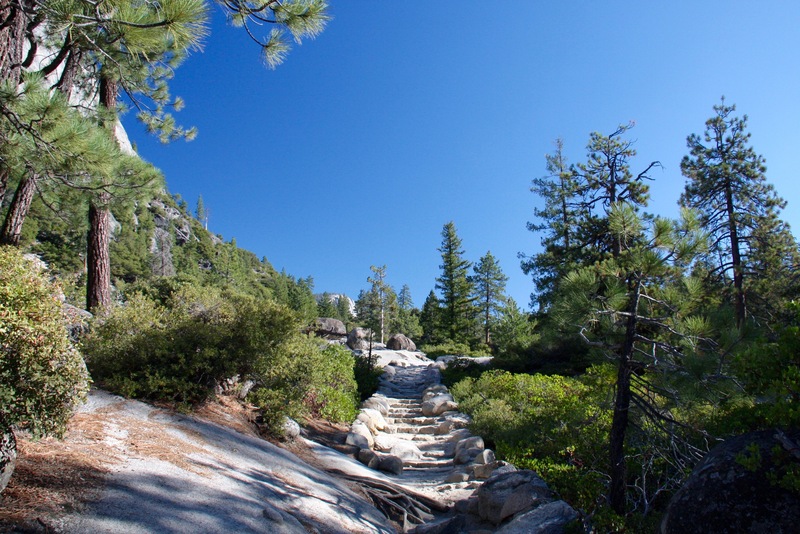 On the return journey I took the Mist Trail route down from Nevada Falls. 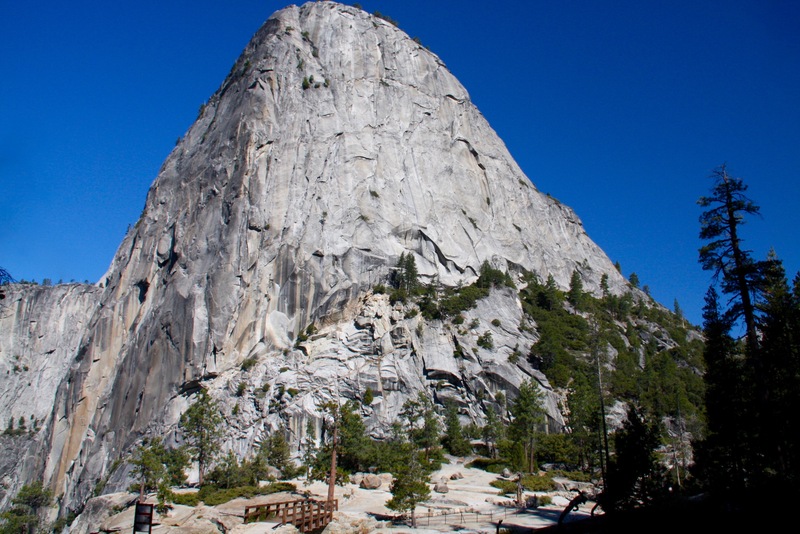 This route passes close to Vernal Falls and offers great views back up to NevadaFalls. It also crosses an area known as the Silver Apron. It looks innocuous, but the river flows fast here and it’s easy to be swept away when in flood. 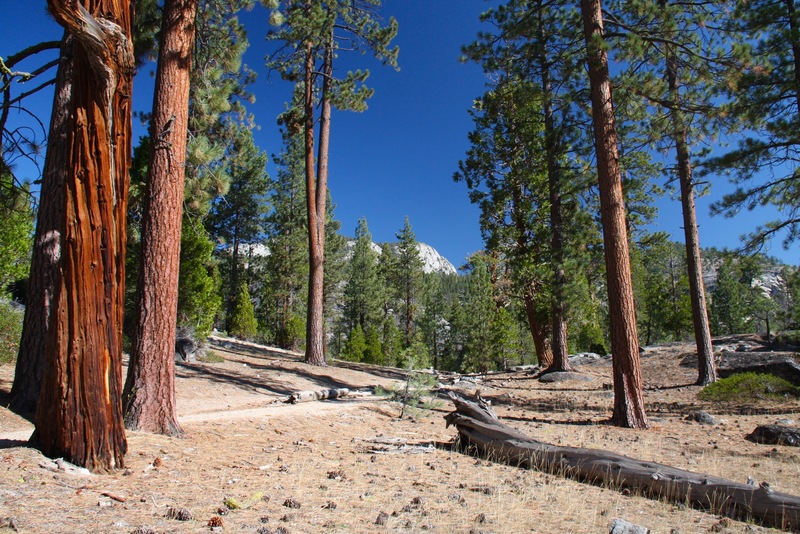 It was here that I finally found all the people that had been conspicuous by their absence further up the trail. 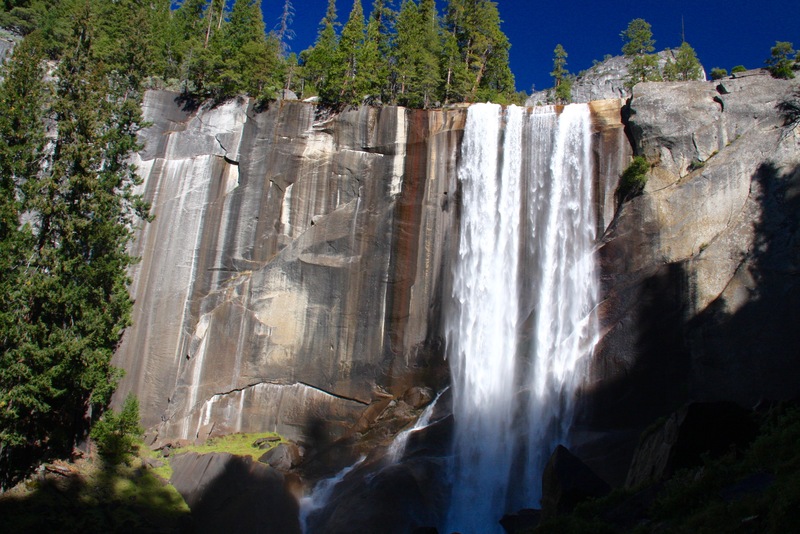 The hike to Vernal Falls isn’t very demanding and is rightly popular. After three or four hours of solitude, I suddenly found myself in a traffic jam. 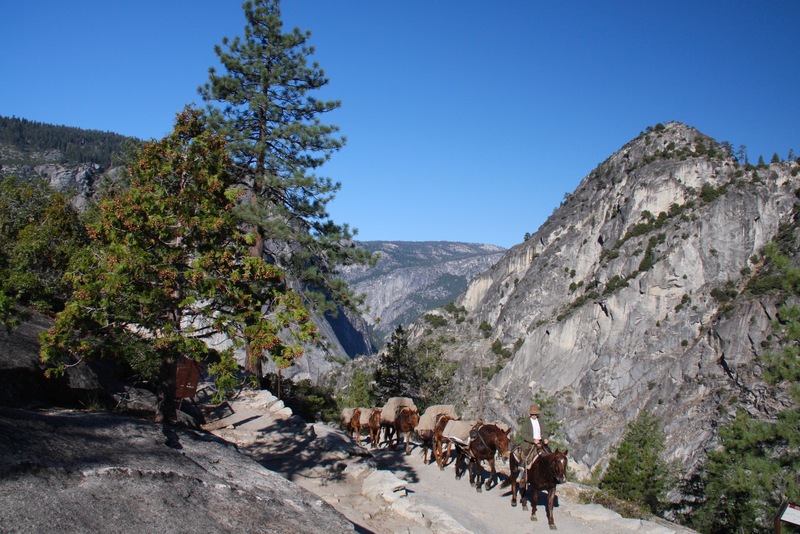 Bizarrely, given the ease of reaching it, and how close it is to the valley floor, the Mist Trail accounts for an unusually high number of deaths. 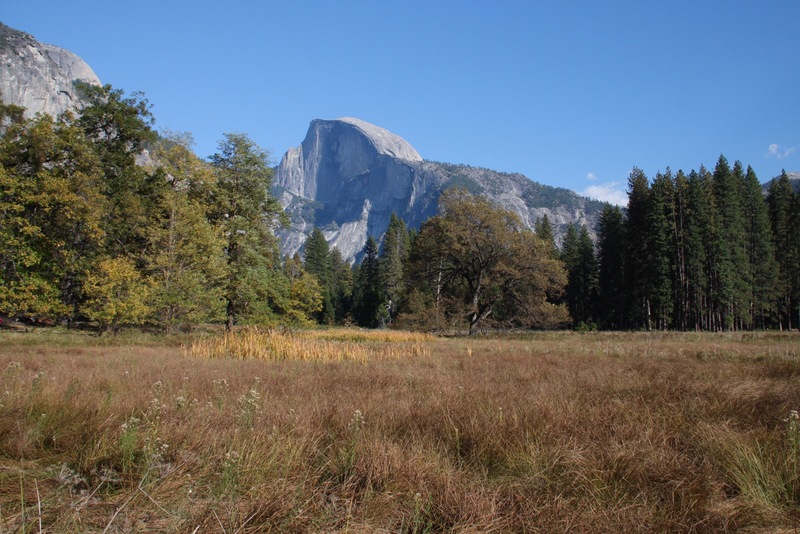 Back down in the valley floor again, I walked to where I could catch a bus back to Half Dome Village. 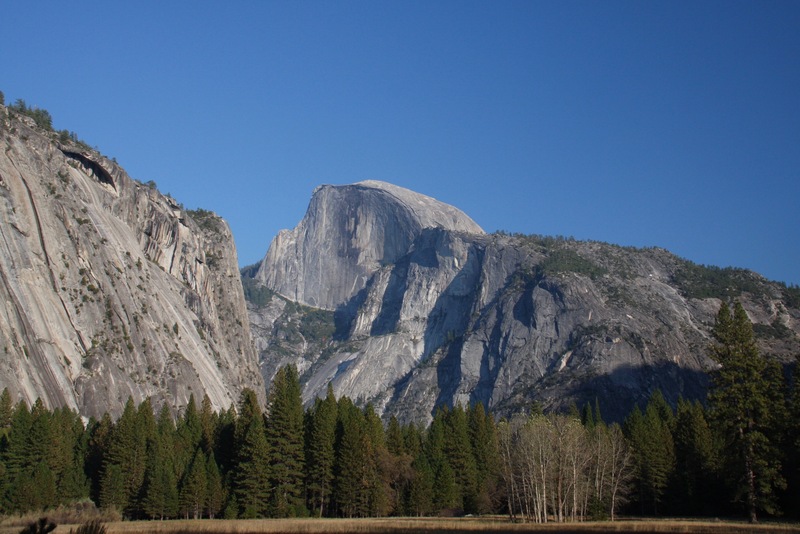 If there’s one thing you can say about Yosemite, it is that it’s very well organised. Something I was grateful for as I wearily climbed the steps unto the bus. I was looking forward to having a cold beer to celebrate not having a close shave with a bear. 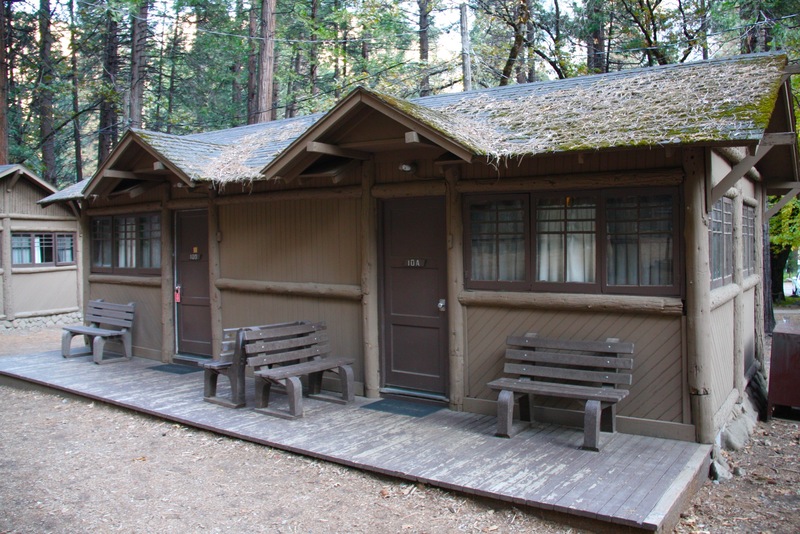 I’ve never stayed anywhere with a ‘Bear Policy’ before, but since our accommodation was in the middle of Yosemite National Park it seemed like a sensible precaution. They take Bear Policies seriously in these parts. Leave even a crumb of food, or anything that may resemble food to a bear (soap, sunscreen, unopened bottles), in your car and it may be towed, and you may be fined up to $5,000 for the privilege. That may seem a bit draconian, but it’s probably a bargain compared to having a bear smash its way into your car. I’m pretty sure ‘bear invasion’ invalidates the insurance. The average black bear (there are no Grizzlies left in California) needs around 20,000 calories each day. Basically they’re hungry all the time. We made certain that there was nothing in our car that might convince a 300 pound black bear to break and enter. The Bear Policy may have been to blame for the fact that every time I saw, or thought I saw, something moving in the undergrowth, I assumed a bear was about to jump out on me. In reality, that’s a bit fanciful. Having learned the hard way, bears tend to avoid humans, and you’d be quite lucky to spot one while walking in the park. 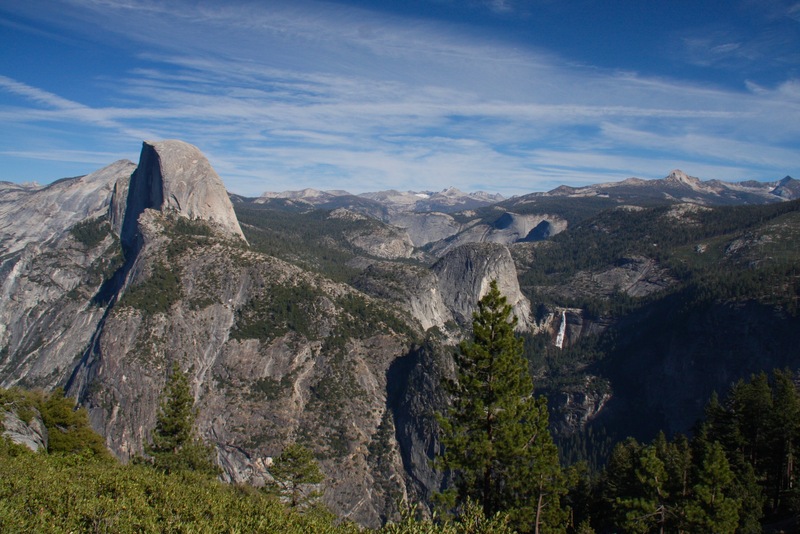 What isn’t hard to spot is the majestic, utterly sublime landscapes of Yosemite. 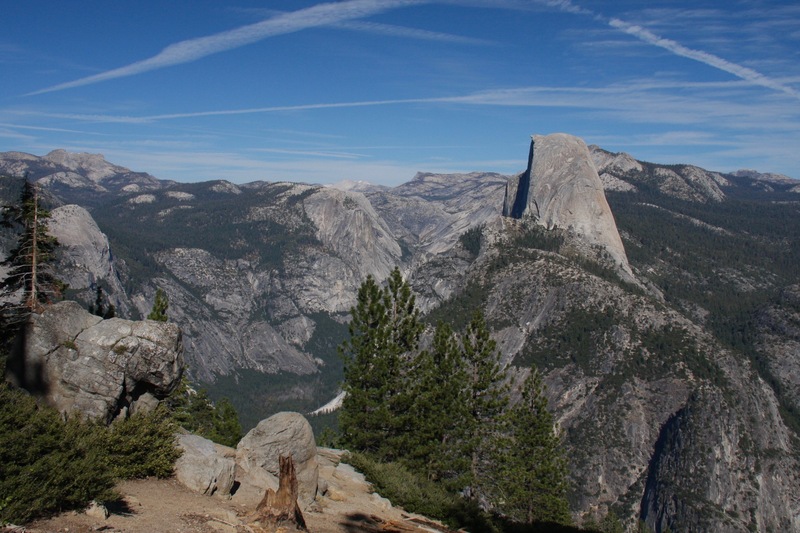 Our first proper sight of Yosemite came thanks to the spectacular views to be had from Glacier Point. 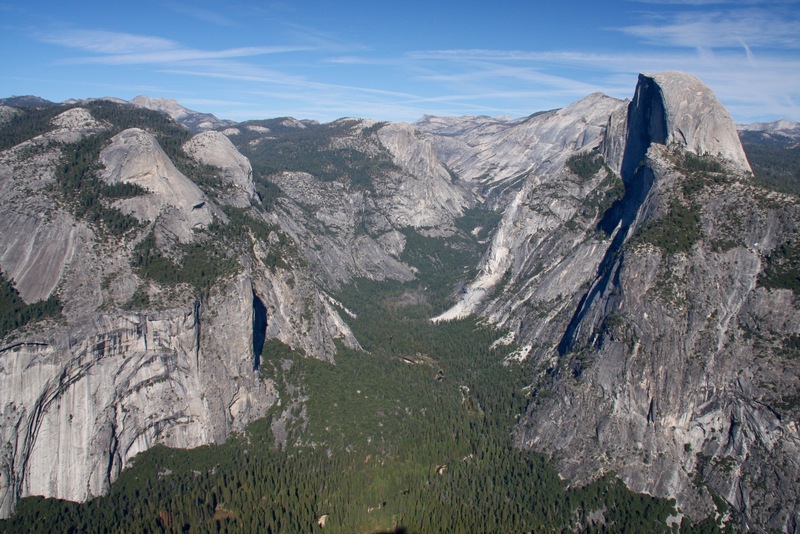 The viewing area stands some 3,214 feet above the floor of Yosemite Valley, the sweeping vistas take in Half Dome, Yosemite Falls, Vernal Falls and Yosemite’s high country. It’s magnificent and I could have spent hours drinking in the views. I have about a million photos to prove the point. 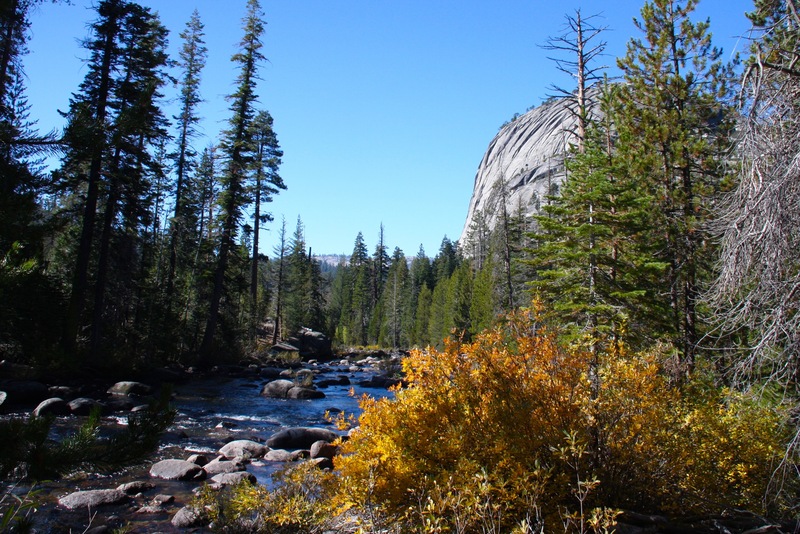 Yosemite is, however, a ‘must see before you died’ destination. I say that with some confidence, it’s spectacular. A pre-dawn start from San Francisco saw us driving over the Bay Bridge in the dark and watching the sun rise in the Central Valley en route to Merced. 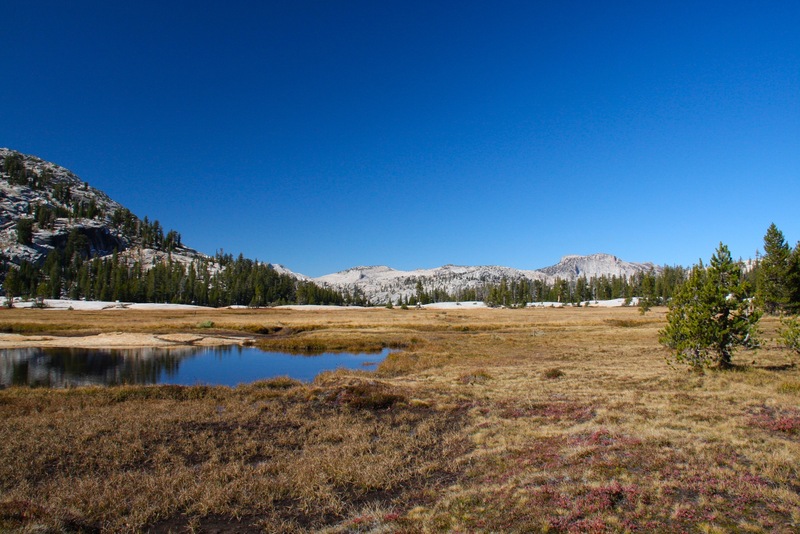 We were on our way to Yosemite Valley, and a log cabin at one of the few accommodations in the park, but first we made a detour. 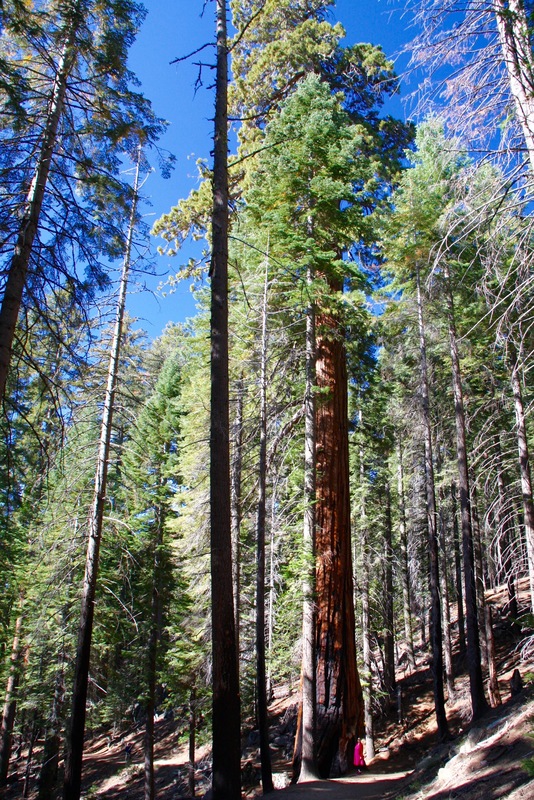 Knowing we didn’t have time to appreciate the glories of Sequoia National Park, but wanting to see some of the Sierra Nevada’s legendary Sequoias, we got our ‘big tree fix’ at the Mariposa Grove of Giant Sequoias (currently closed for restoration). 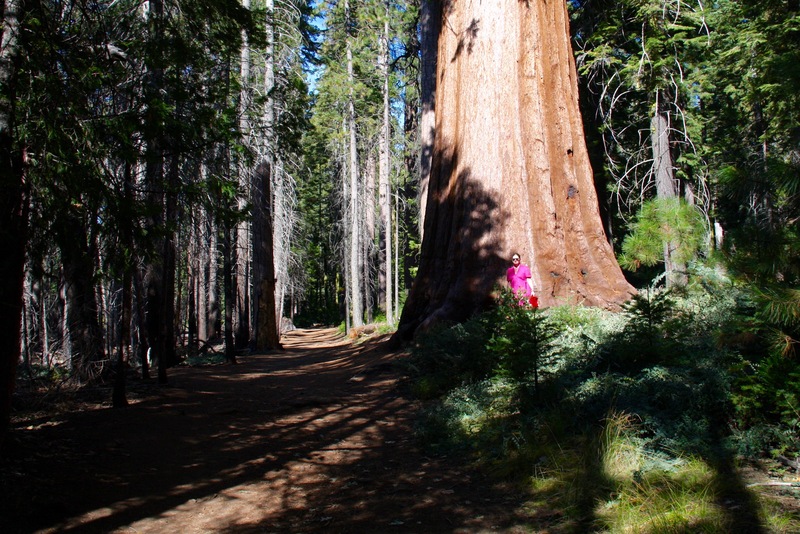 It’s all in the name really, but this is a fantastic area that contains the largest sequoia grove in Yosemite. 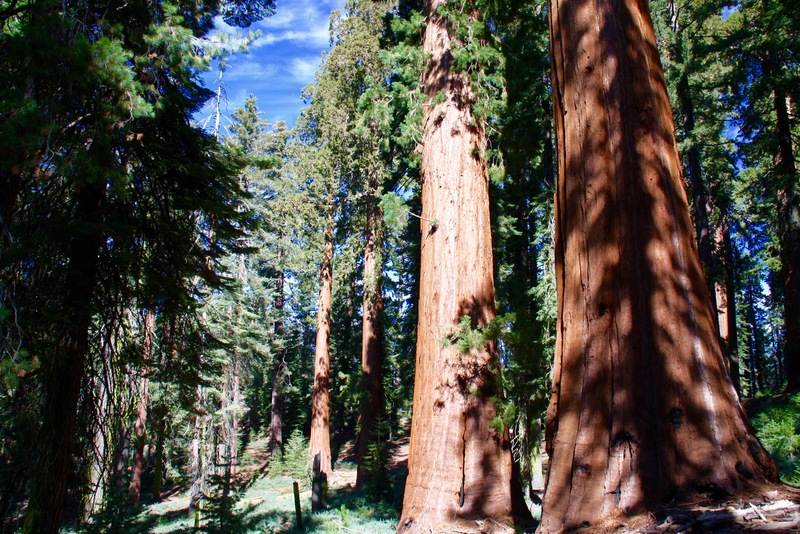 There are trees here that are over 1,800 years old, including the famous Grizzly Giant. 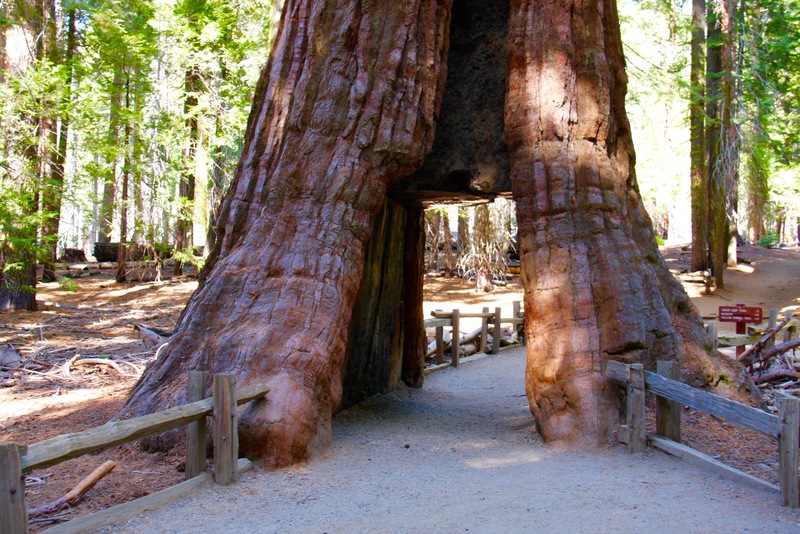 There are trails that make big tree spotting easy, and which take you through the middle of the California Tunnel Tree. 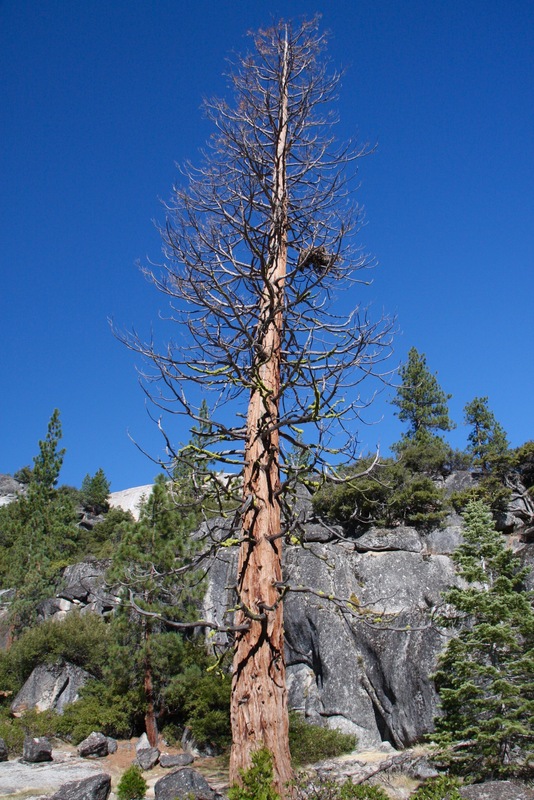 Yet another giant Sequoia, it had a hole carved into it in 1895 that allowed horse drawn carriages to pass through. 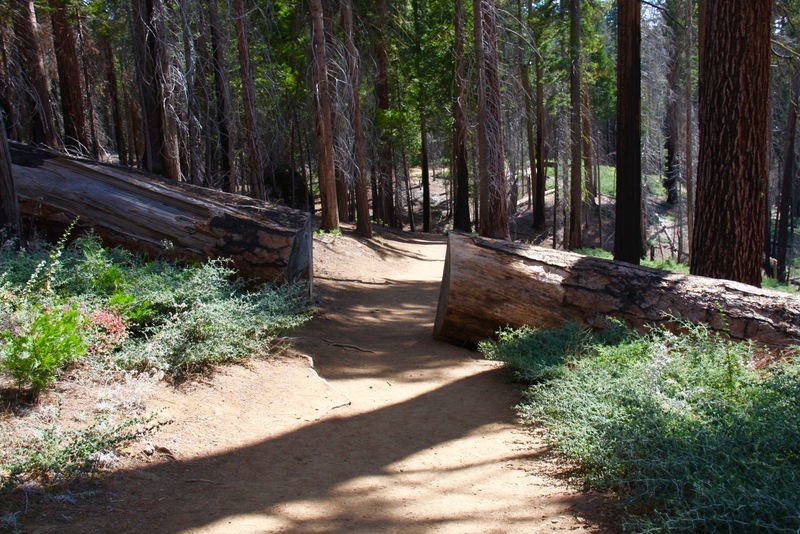 Today you can walk through the gap. 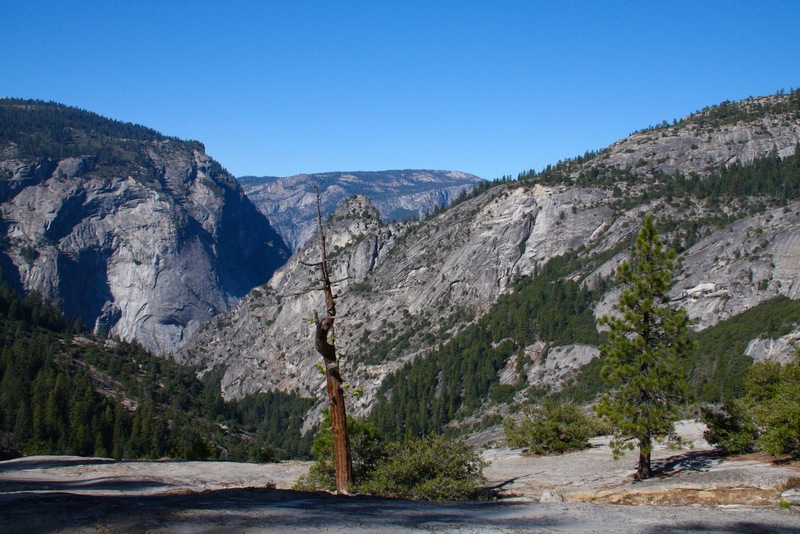 When we finally descended into Yosemite Valley it was a little like entering a dream world. 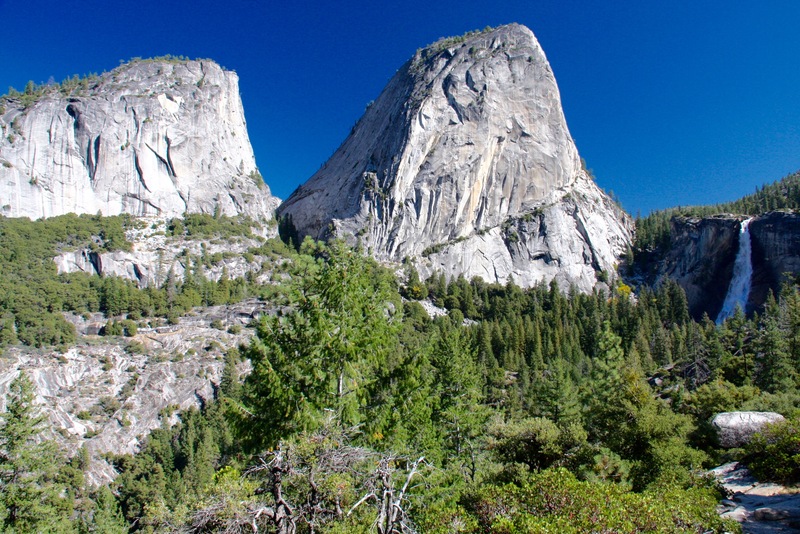 This is a remarkable place, a lush green valley surrounded by vast granite monoliths and vertical valley walls. At the far end of this Wonderland was our home for the next couple of days, a log cabin (equipped with bear-proof everything) in Half Dome Village.